The environmental reasons behind piling disposable diapers in a landfill – 27.4 billion diapers are consumed every year in the United States. These diapers just pile up higher in a landfill on a daily basis. Better for preventing skin problems – cloth diapers are better on a baby’s bottom versus daily use of disposable diapers. Regardless of the reason behind it, the choice to use cloth diapers can often become a rather trying process to find what may work for each specific person and their situation. 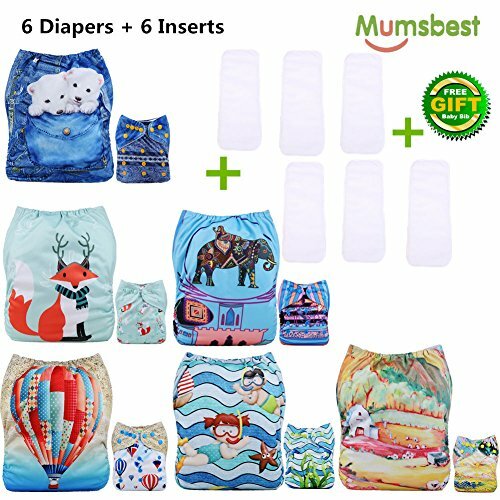 Cloth diapers are very much a trial and error type of commitment; if one type fails to fit a family’s needs, before giving up completely, it is suggested that another type be tried. The process can be a headache, unless an open mind is used when approaching the process of finding what works for each baby specifically. Pocket diapers are one of many available options when it comes to cloth diaper types. This type of diaper has an outer layer that is waterproof and an inner layer that is generally made up of some type of stay dry material. Between these two layers is a pocket, where absorbent material referred to as an insert is placed. The insert is usually “stuffed” into the pocket opening, then the diaper is placed on the baby. These diapers are used once and then need washed before they are able to be used again. There are numerous other types of cloth diapers, including all in ones, all in twos, prefolds, fitteds, flats, and hybrid fitteds among others. Sizing is also another thing that requires thought before choosing a cloth diaper. Sized diapers generally only fit the baby when they are at a specific weight size. One size diapers usually have snaps or adjustable elastic to allow for longer use across multiple weight ranges. Newborn sized diapers are just as their name implies – sized to fit a newborn’s weight and size. Cloth diapers also come in a variety of material. It is truly a “something for everyone” type of scenario in which there are so many different options available to choose from, there is bound to be something that works for everyone’s specific situation. Some popular material types include bamboo, fleece, hemp, wool, cotton, microfiber, zorb, and minky. Most of the diapers listed here have snap closures. While snaps are a popular choice in choosing what kind of diaper closures to use, they are not the only option available. Cloth diapers can also have velcro closures as well as what is referred to as hook and loop closures. Some diapers, such as flats and prefolds do not come with attached clsures and instead require some type of separate accessory, such as something called a snappi or a safety pin, to keep it secured. 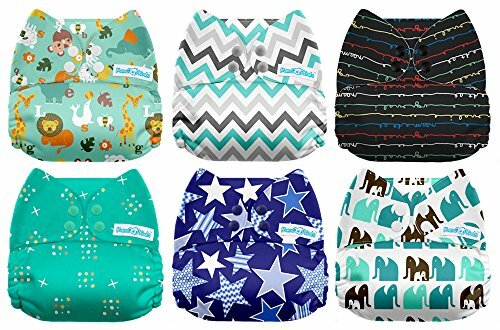 Here is a list of some of the most popular diapers, all of which have been well reviewed, with thumbs up from nearly everyone who has added these to their rotation of cloth diapers. First on the list is the Wegreeco Washable Reusable Baby Cloth Pocket Diapers set comes with a pack of 6 pocket diapers and 6 inserts. The diapers themselves are one size, allowing them to grow as baby grows. They are made of 100% polyester and PLU to provide comfort and keep the wetness contained rather than leak out. The diapers are that of a gender neutral print variety, making them perfect regardless of the baby’s gender. The included inserts consist of 2 layers of microfiber and 2 layers of bamboo. This set also comes with a wet bag for storing the diapers. 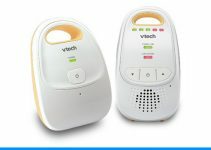 The wet bag has a zippered pocket and is waterproof, making it usable for both wet, dirty diapers and clean, dry diapers. The actual weight recommendations are with a minimum weight of 8 pounds and a maximum weight of 33 pounds. 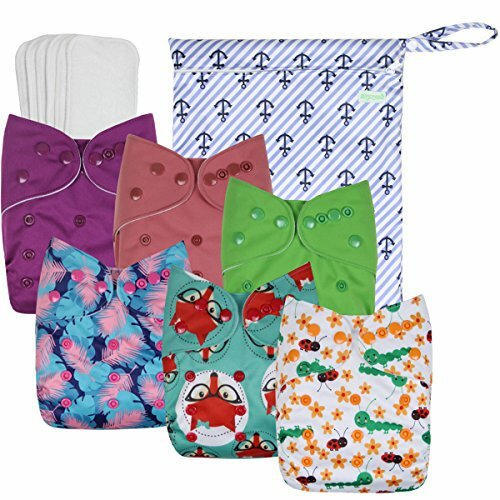 The Alvababy New Reuseable Washable Pocket Cloth Diaper set includes 6 pocket diapers and 12 inserts. The diapers are one size, with adjustable snap settings, which allows them to be used from 8 pounds up to 35 pounds, depending on the snap setting used. The diapers have an outer layer of PUL, with the inside being made of suede to keep the moisture from resting against the baby’s skin. The inserts included in this set are made of 3 layers of absorbent microfiber. The GroVia O.N.E. Baby Cloth Diaper is an all in one cloth diapers. This means it has extra absorbency built right in to keep from any leaks. It comes with additional snap in soaker inserts to help keep baby dry. Included is one small soaker pad and one large soaker pad.The GroVia O.N.E. has both snap closures as well as a hook and loop option. The diaper is meant to last as long as baby needs to use diapers, fitting from 10 to 35 pounds. This particular diaper is the Cloud color, coming in a grayish black color. The Alvababy Baby Cloth Diapers One Size Adjustable Washable Reusable set comes with 6 cloth diapers that are of the pocket diaper style. The set also includes 12 3 layer microfiber inserts. The diapers themselves are considered to be of gender neutral colors, which makes them the perfect choice regardless of the baby’s gender, whether it will be a surprise or not. The Alvababy pockets are one size, allowing them to be adjusted to fit baby from 8 to 35 pounds. The diapers consists of snap closures which also helps to make them easy to adjust as baby grows. 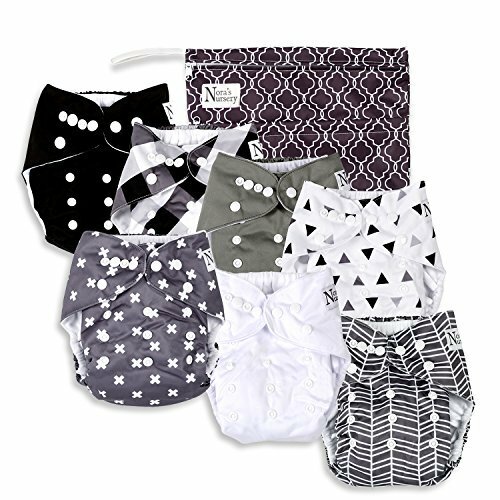 The Mama Koala set is one that comes with 6 one size pocket diapers, featuring prints that could be considered gender neutral. The one size diapers fit a weight range of 8 to 35 pounds with easy to adjust snap closures. Also included in this set is 6 inserts, each made of 3 layers of microfiber. The diaper has a large pocket opening to make putting in and removing the insert easy and hassle free. 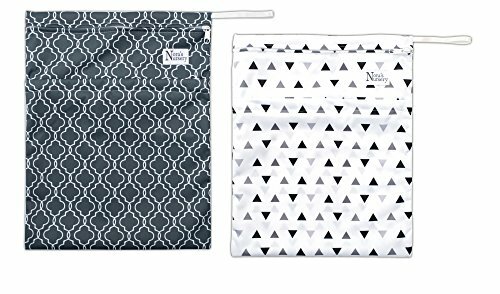 The Baby Cloth diaper set by Nora’ Nursery comes with 7 one size pocket diapers in gender neutral printed colors. It also included 7 inserts made of 2 layers of microfiber enclosed by 2 outer layers of bamboo, to make it both soft and exceptionally absorbent. The diapers themselves have easy to use adjustable snaps to allow the diaper to be used at weight range of 8 to 35 pounds. These diapers also have leg gussets, which help to protect against any leaks that may otherwise happen. The set also comes with a wet/dry bag. 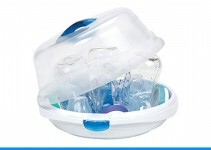 It has 2 separate zippered openings to allow for the storage of both wet, soiled diapers and clean, dry ones. The Babygoal Baby Cloth Diapers set comes with 6 one size pocket diapers. The diapers have snap closures to adjust the size, depending upon the baby’s weight as the one size weight range is 8 pounds to 35 pounds. The 6 included inserts are each made with 3 layers of microfiber. The diaper’s pocket opening is wide enough to make both inserting and removing the microfiber inserts easy with no stress or hassle. This particular set also comes with a wet bag to store soiled, wet diapers in until laundry time. 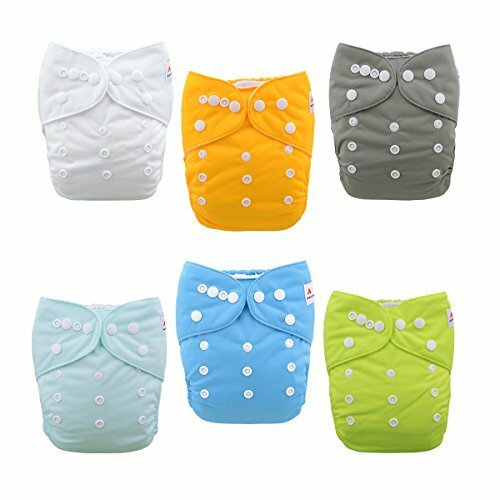 The Mumsbest set includes a set of 6 gender neutral printed and solid colored cloth diapers. The diapers have snaps and fit a weight range of 10 to 33 pounds. The included inserts, which consist of 6 per set, are made with 3 layers of absorbent microfiber. Also included in the set is a 11.8 inch by 15.7 inch wet bag. The wet bag has 2 zippered sections which makes it perfect for storing both wet, dirty diapers as well as any dry, clean ones. 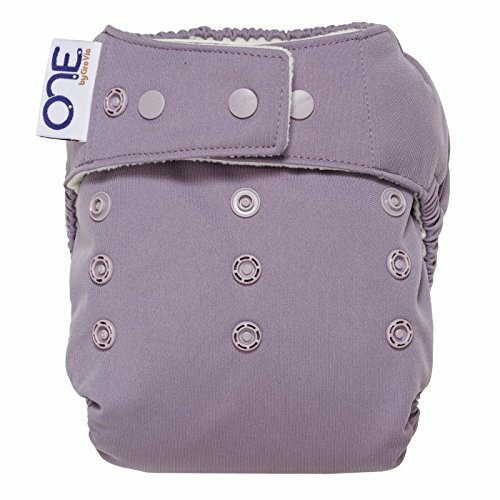 This particular wet bag can hold around 9 to 12 diapers at one time. The Ohbabyka one size pocket cloth diapers are an option when it comes to finding diapers that have cute prints and do their job while not breaking the bank. This particular set comes with 3 snap closure diapers and also included 3 inserts. The diapers, being one size, adjust to fit babies with a weight range from 8 pounds to 35 pounds. The inserts are made from 2 layers of terrycloth with a layer of microfiber between the two. 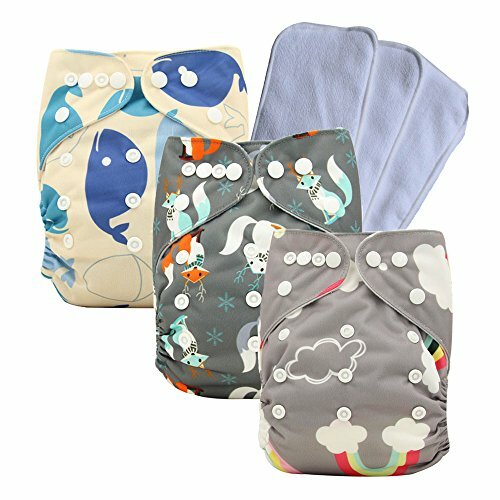 The inside lining of the diaper is made with a bamboo suede material, which is often a softer and more comfortable lining to have against baby’s delicate skin. The last cloth diaper set on this list is Nora’s Nursery’s Perfect Peonies set. 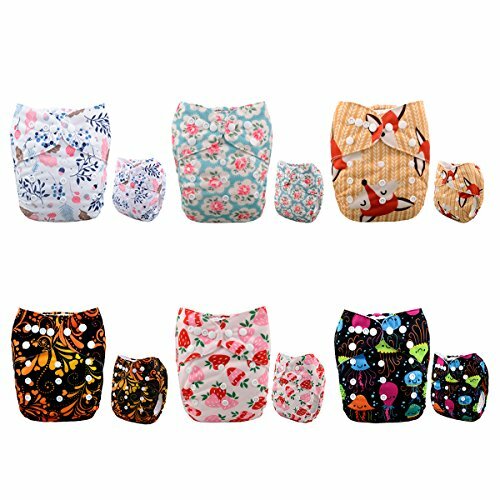 It includes 7 one size pocket diapers in a variety of beautiful girl themed prints and colors. The diapers have snap closures which allow for them to be easily adjusted to fit babies even as they grow. These diapers fit a weight range from 10 pounds up to 35 pounds, which can allow them to be used over a long period of time. The 7 inserts that come with this set are made of 2 layers of microfiber that are enveloped by 2 layers of bamboo. Also included in this perfect little starter set is a wet/dry bag. This bag has 2 separate zippered compartments to make keeping both dry, clean diapers and dirty or wet ones separate. These cloth diaper sets, while all similar, offer a variety of features, all of which make perfect solutions when it comes to trying to find the perfect cloth diaper to use on babies. 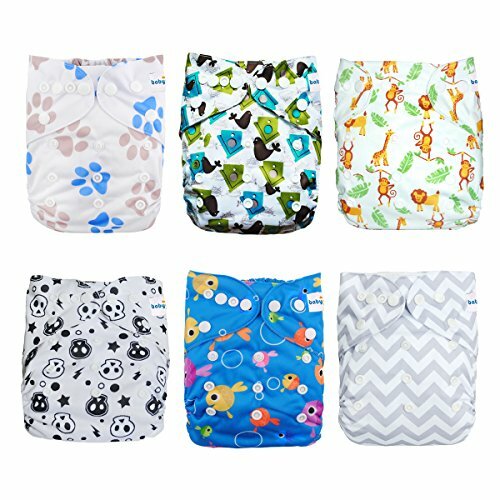 If one sized pocket diapers with snap closures are what fits a particular situation, any of these diapers would be the perfect pick for long lasting comfort, without breaking the bank, while still avoiding the need to sacrifice any type of quality. Again, remember, just because one type or even specific diaper does not work for a particular baby or situation, does no mean that no cloth diaper will work. Just as there are different brands of disposable diapers and each will fit a family’s needs differently, cloth diapers are the same. With each type and brand having a different outcome for each cloth diapered baby. Once the perfect diaper is found, it all comes together.